Don't get me wrong, I love my summers but when the leaves start to fall in Autumn I can't help but get a little excited about what's to come. After all, it means the start of jacket weather and all the beautiful outfit possibilities that come with it. So I know I'm a little late offering up my Autumn essentials... We are at the end of May, but Perth season changes have been getting later and it means I can talk to you about the pieces I have been living in this Autumn and will likely take me through most of Winter. Here are my essential pieces for Autumn. I've owned many forms of Duster Jacket and lightweight trench over the years and I can't say I ever get sick of them. Every one I've ever owner has transitioned through most of the year and are perfect for Perth weather since we only have a month or two a year where they're not suitable. A Lightweight trench is perfect for layering over pants and creates the ultimate cool girl look over denim shorts. My most recent favourite is from a label I wear a lot, Decjuba. Decjuba recently released their D-Luxe Basics range, a not-so-basic, streetwear basics range with a sports luxe vibe. Their Luxe Soft Trench is made from a lightweight stretch poly that's perfect for layering and feels amazing. 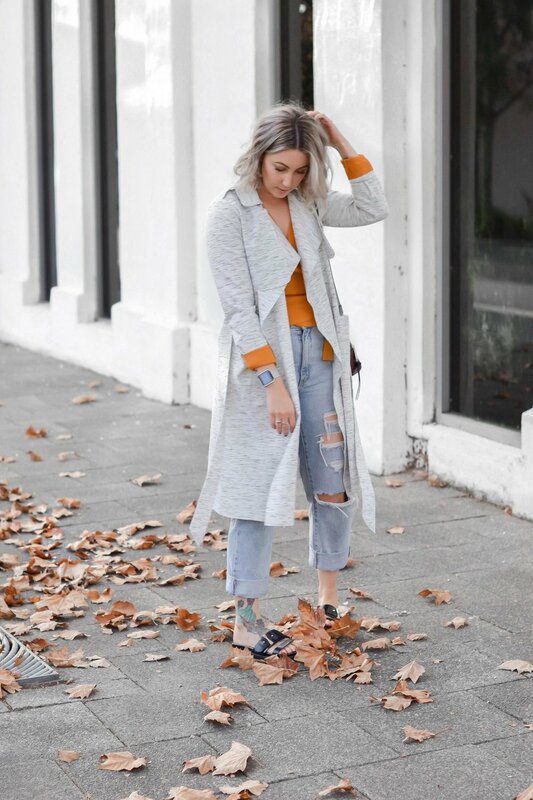 Pictured: After Sunset Wrap Top & Rollas Original Straight Jeans from Lock & Key Clothing, Luxe Soft Trench from Decjuba and Hunter Slide by Rochessa. Long sleeves and a jacket in cool weather... seems obvious right? It might not be a groundbreaking fashion statement but one thing I love to do with long sleeves and jackets is roll up the cuffs with the inner shirt exposed or pull the sleeve out past the jacket cuff. It's a lovely way to tie the outfit together or bring attention to any details on the sleeve. When it comes to Denim jackets, well I know you all know I'm a loyal jeans girl. So aside from being a wardrobe staple it's given me a way to get my denim fix while venturing away from my regular uniform. I recently bought Sportgirl's Classic Denim Jacket after I borrowed one for a shoot from my stylist friend (Nat, from The Other F Word). I loved the fit and she raved about how versatile it was... she was right (as if she wouldn't be) and I've been living in it since. Pictured: Garden Party Dress from Lock & Key Clothing & Classic Denim Jacket from Sportsgirl. I'm particularly happy about this trend making a comeback. I had a few Chenille jumpers back in my early teens and I always say it's great when retro pieces make a comeback because you get to restyle them with better hair choices (lol). I'll admit there can be some tragic uses for Chenille (I'm getting flashbacks of hideous multicoloured hand knitted scarves and beanies) but when the weather is cold don't you just wanna be wrapped in something soft and cozy? Decjuba is currently doing a classic knit shape in soft pink and khaki Chenille for the season. Cara Chenille Pullover from Decjuba, Rollas Original Straight Jeans from Lock & Key Clothing, Hunter Slide by Rochessa.